Dogs were brought in to assist with the search for bodies in New Orleans. 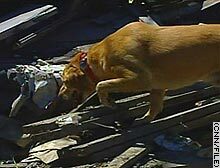 NEW ORLEANS, Louisiana (CNN) -- Searchers found two more bodies in the devastated Lower 9th Ward of New Orleans on Sunday, along with bones that may be from a third person killed by Hurricane Katrina. Student volunteers assisting with debris removal in the district reported seeing a body in the rubble of a home in the neighborhood, said Steve Glynn, special operations chief for the New Orleans Fire Department. Search dogs indicated a second body was nearby, so authorities began picking through the debris pile with a small bulldozer, he said. "We went over through a thick pile of debris and saw what were remains and had reason to believe there could be somebody else," Glynn said. "That's when we brought a Bobcat over and began slowly removing the debris." The bodies were badly decayed, and authorities had no immediate indication of their age or gender. More than 1,100 deaths in Louisiana have been blamed on Katrina, which struck August 29 near the Louisiana-Mississippi state line. The storm also killed more than 200 people in Mississippi and 15 across Florida, Alabama and Georgia. Katrina blasted Mississippi's coastal towns and undermined the levees around New Orleans, leading to flooding that left more than three-quarters of the city under water. Searchers also turned up bones at another location in the neighborhood that are suspected to be human, Glynn said. Those bones have been turned over to an anthropologist for further examination. State Medical Examiner Louis Cataldie said 300 to 400 bodies have yet to be recovered -- a figure he based on the number of people who have called week after week in hopes of finding news of missing loved ones. The renewed search for bodies was spurred by fears that workers inadvertently may remove remains of storm victims when they clear debris from wrecked homes in flood-damaged neighborhoods such as the Lower 9th Ward, Lakeview and New Orleans East.